Just as the ghosts of this place were slipping out of Aidan Coleman’s world, he reached out and pulled one close. Maybe it takes a kind of medieval faith for a man of his accomplishments to reach 30 and still be chasing a first Grade One Festival win but, just as Paisley Park finally got him to the mountain-top, Coleman’s thoughts immediately went vaulting back seven years. Three months after Campbell Gillies delivered Brindisi Breeze to victory in the 2012 Albert Bartlett, Coleman was at his funeral, handing Lesley Gillies a beautiful photograph of her son, taken on his most glorious day. In it, Campbell is on the phone to home in the back of Aidan’s car, his young Scottish face magnetised by that first big marquee win. He died the day before his 22nd birthday, drowned in a swimming pool within 24 hours of departing for a hastily-arranged trip to Davos with four other jockeys. After the rain then, Cheltenham found light in a great, arcing rainbow of romance yesterday. Irish hearts might have ached for another Faugheen sun-dance, but the English won the big auditions with Paisley Park, a horse once at death’s door with colic, claiming the Stayers’ Hurdle and the wonderful Bryony Frost becoming the first female Grade One winner at the Festival, taking the Ryanair Chase on Frodon. And for Coleman, not quite an habitué of this place, just to feel the drench of big-day euphoria on his neck had to be something precious. 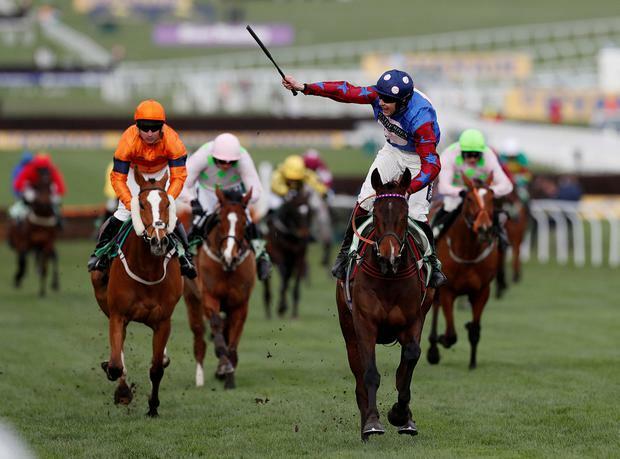 From Innishannon in Cork, he has made England home for 13 years now (three days after completing his Leaving Cert, he was working for Henrietta Knight in Lambourn) and is broadly considered a possible successor to ubiquitous UK champion jockey, Richard Johnson. Coleman, after all, has close to a thousand winners to his name now but, until Ascot last December, none at Grade One level. That, he says, is a stat that “almost embarrassed” him. But a man with such a tally of winners is hardly deficient in backbone and it’s fair to say he stepped from that Ascot win utterly convinced that Paisley Park was the horse he had been waiting a lifetime for. Coleman did have a Festival winner before, Kayf Arms getting home first in the ’09 Pertemps. And he lost the 2017 Champion Chase only by a nose on Fox Norton to Special Tiara. One year earlier, he was first home in the Cross-Country on Any Currency only to have the horse disqualified for failing a drugs test. So this was never exactly a place that spooked Aidan Coleman. If anything, he protests, his record was actually good around the track. Just not quite in March. Not quite with the marquees up. And, face it, Grade Ones don’t come easily. He understood that. Coleman must, after all, have ridden a hundred of them before Ascot. So, on Wednesday night, he parked thoughts of Paisley Park and the palpable affection for his owner, Andrew Gemmell, in some tranquil corner of his mind, filling the rest with anything humdrum he could find. He played PUBG (Player Unknown’s Battlegrounds) on his Xbox. He watched Liverpool win in Munich. And once he sought it, sleep came readily, Coleman feeling for all the world like a man just waiting for history to organise the paperwork. If anything, his trust in Paisley Park equipped him with an almost eerie sense of certainty. That he patently does but, sometimes, a jockey’s story can incubate uncomfortable worries. Coleman famously deserted 100/1 Grand National winner Mon Mome in favour of Venetia Williams’s stable companion, Stan, ten years back and duly fell at the seventh. While he’s had his share of major handicap victories, including the 2014 Welsh National on Emperor’s Choice, if you googled his name before Paisley Park came into his world, the story stubbornly topping Coleman’s profile page was being punched by a drunk who broke into the weigh-room at Southwell in 2015. 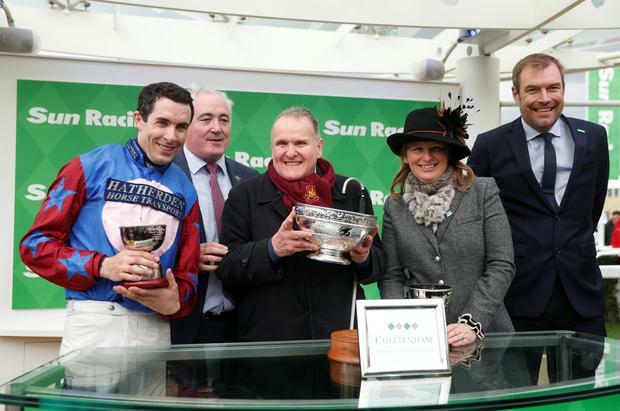 This then was a different altitude on which Coleman, son of two schoolteachers and brother of Galway Plate-winning jockey, Kevin, was about to come under scrutiny. And Paisley Park, backed to witheringly tight odds of 11/8, was already being name-checked in the company of staying giants like Big Buck’s, Inglis Drever and Baracouda. Failure here would have been public. And, most likely, pitiless. The horse has a sprinter’s finishing kick and Coleman kept him inconspicuously out of the course commentary, Sam Spinner, Faugheen and Kilbricken Storm generally setting the pace. In fact, coming down the hill, it was a moot point if the favourite was even interested. Was there ever a moment Coleman maybe feared he’d left their business too late? Maybe not, but crashing clumsily through the last hurdle, Paisley Park maybe needed some angels on his side too. A little flashbulb of panic, though? “For a couple of seconds,” he agrees. “But, soon as I landed. I gathered him up, and he took off again. I knew we’d win then. But then, ten years is an eternity in a jump jockey’s life, given the bones that break and the dreams that routinely vanish. Those words resonated gently a little later in the day as another Corkman, Noel Fehily, retired in tears, having secured his seventh Festival win on Eglantine Du Seuil in the penultimate mares’ novice race. Fehily too is a man who made his base in England, earning the resolute respect of trainers like Harry Fry, Neil Mulholland and Tom George. 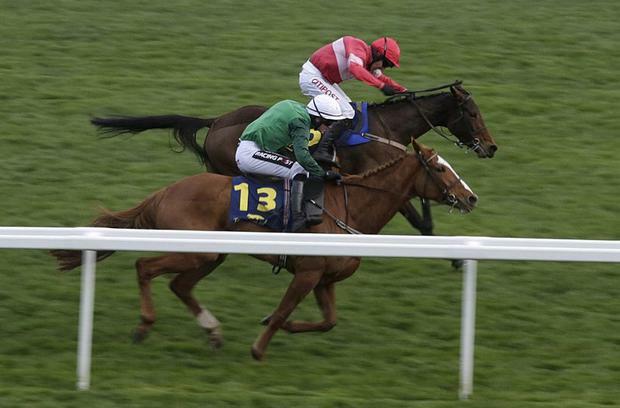 In 2012, he won the Champion Hurdle for Paul Nicholls on Rock On Ruby. “I spoke to my wife and family earlier in the season,” explained the 43-year-old Dunmanway man. “I’m not getting any younger and it’s time to let the younger lads get on with it. Time is fickle and Aidan Coleman patently doesn’t need anybody to tell him how threadbare the good days can seem in recall or how cruel the spirits that, sometimes, overtake these lyric moments become. Two months after, Campbell died, Brindisi Breeze was gone too, having somehow crossed two fields to blunder onto a busy road. “At least we’re here,” he smiled, the good wishes splashing around him and a gentle sadness in his chest.